You gave us your preferences and we saved your results. Whether you or someone you love is going through a painful experience, we’ve collected videos, articles, recommendation from experts, and other resources that can help. Grief is one of the most universal human experiences, but all too often, no one talks about it. Here you can discuss loss openly and honestly with people who are going through it. Whether it’s an unexpected diagnosis, mental health concerns, or an ongoing disability, dealing with health challenges can be scary and isolating. Here you’ll find others who know what you’re going through. One of the best things we can do for our kids is help them build their own resilience, so they can handle whatever life throws their way. Here you’ll find others who are working to do just that. Divorce, struggling to have children, family rejection—challenges like these can be disorienting and devastating. Here you can connect with others who are going through the same thing. Incarceration can be traumatic and stigmatizing, both for those who serve time and for their families. Here you can connect with other people who understand what you’re going through. Abuse can inflict physical and emotional wounds. Shame and fear can lead to isolation and a lack of understanding. Here you can connect with others dealing with these issues firsthand. Learn strategies to build everyday resilience. OptionB.Org addresses a range of life-changing challenges. We focus on topics that are important to our community. Please let us know if you’d like to suggest a new topic that’s important to you. 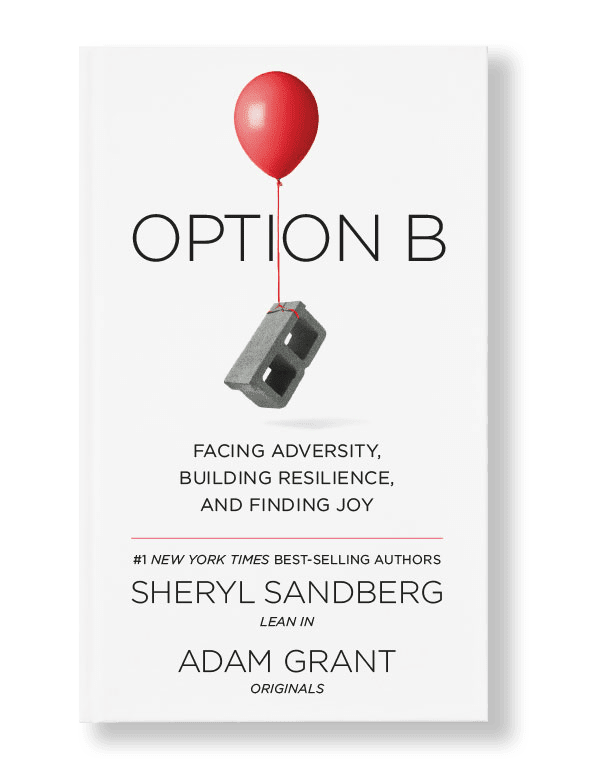 Option B is a new book by Sheryl Sandberg and Adam Grant about facing adversity, building resilience, and finding joy.